David Starkey limped on to the stage in a foot brace, asking his audience not to feel sorry for him as it was his own fault. He then sat down and rested his foot on a stool and proceeded to tell the audience of how he was planning originally to give a talk about all of Henry’s wives but decided to concentrate on Catherine of Aragon, as Peterborough Cathedral was her final resting place. Starkey went on to say that female historians, in his mind, haven’t helped the image of Henry, as the majority see Catherine as the good, honest and loyal wife who ultimately suffered because of Henry’s selfishness. Starkey commented that this was not dissimilar to Shakespeare’s rendition of Catherine in ‘Henry VIII’, where Shakespeare has used the Blackfriars speech. As with all great literature, it was probably taken verbatim to which he joked, “Shakespeare knows a good prose when he sees one”. David Starkey admitted that he believed Catherine of Aragon was a good and honest woman and then turned to Archdeacon of Peterborough and asked, “We can all be good and honest but it is to a certain degree isn’t it?” To reinstate his beliefs Starkey spoke of the findings in the Spanish State Archives and of the letters written to her father Ferdinand of Aragon, those dealing with Catherine of Aragon’s first miscarriage and of how she and her physician chose to lie to her father about the dates of the miscarriage. Although there are reports of Henry being furious about these lies, Starkey implied that Henry possibly knew. 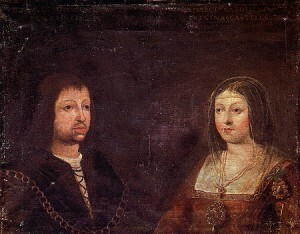 Wedding portrait of Ferdinand and Isabella, Catherine’s parents. Catherine was more of a warrior princess, being brought up in the camps and witnessing the military triumphs of her mother Isabella of Castile and father Ferdinand of Aragon. Catherine and her siblings were educated and prepared to unite their Kingdoms, as if to surround France via the Netherlands, Portugal and with Catherine, England. Henry, on the other hand, was brought up surrounded by women, growing up around his sisters and mother, and in jest Starkey called Henry a “mummy’s boy”. Henry wasn’t taught the ways of a King but was known as the ‘spare’ in complete contrast to his older brother, Arthur, who resided at Ludlow to learn how to become a King. With this, Starkey brought up a modern day relation to how some parents still send their sons to boarding schools and how it is proven that boys who attend boarding schools become better leaders. David Starkey summed up Henry as the ‘perfect boy’, tall at 6ft 2, strong, handsome, poetic, scholarly, intelligent, sporting and creative, “A strong, strapping, rugby playing type”. Starkey spoke of Henry and Catherine’s wedding day and mentioned how many today assume the weddings of history weren’t as elaborate, something that is incorrect. Starkey, with enthusiasm, spoke of the rich tapestries, the choirs and how a walkway was constructed at head height, purely for the public to see the royal couple and plinths for them to pledge their vows. The clergy were moved out of the way to allow the public to see this special occasion and it was in a very similar standard to what Royal weddings are now, “minus the stupid trees” joked Starkey. He then, ‘raised concerns’ of how the only two times monarchs have married in St Pauls it has ended badly (Henry to Catherine of Aragon, and Charles to Diana). Starkey explained how in the past people didn’t marry for ‘love’ (or ‘lurve’ as he often referred to it) but more for power/convenience and of how kingdoms would be willing to make ties regardless of human emotion. A good example is Catherine’s sister, Isabella, who married Prince Alfonso of Portugal in Seville, and when he passed away, Isabella wed Manual I of Portugal, Alfonso’s uncle. Starkey stated, “if at first you don’t succeed…try and try again” which was soon to be the case with Catherine, sent to England to marry Arthur Prince of Wales, whom sadly passed away of suspected tuberculosis and in 14 months time, was betrothed to Henry. He then made reference to Henry walking Catherine down the aisle to marry his brother Arthur. He spoke of how the King and Queen had separate apartments and made reference to the layout of Hampton Court and how the courting rituals of the monarchy were reduced to the Groom of the Stool knocking on the Queen’s chamber asking, “How dothe the lady feel?” David Starkey then paraphrased in his own dry wit as to ascertain if the queen had a ‘headache’. Starkey spoke of how everything in history is intrinsic, it just wasn’t a case of Henry marrying Anne Boleyn, it was all the small things that led up to the break with Rome and he said how the ‘problem’ was Henry couldn’t help falling in and out of love. This was the crux of the most influential time of English, and indeed world history. It was this simple matter that has transformed the world. In an aside, Starkey spoke of his time at Cambridge, where his tutor was shocked/negative towards him writing an autobiographical account, instead of concentrating on the ‘big events’. Starkey told the crowd that Anne was amazing, intelligent and full of charm, more a French lady than she was a British one and Anne was a part of not only British history but also world history. Starkey made an amusing remark about how Anne, even by the French was seen as a “fine French lady” and not British at all, which Starkey said was a very high compliment indeed. As was the time, the French were designed for seduction, unlike the British. Anne, naturally different to Catherine, set out to be the complete polar opposite of Catherine, hence the different stance in religion – if Catherine was Roman Catholic, then Anne had to be Evangelical. He painted the picture of how Anne was not conventionally pretty for her time; he even brought up the alleged sixth finger! He spoke of how her black eyes, sallow skin and small breasts were not considered beautiful by Tudor standards. Conventional beauty of the time was similar to what we now perceive to be attractive i.e. blonde, big busted and blue eyes. 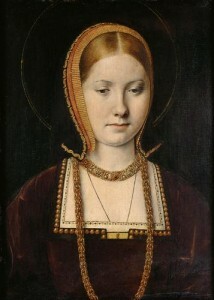 It was more Anne’s charm and education that attracted Henry, in contrast to the old noble, dutiful and less attractive, Catherine of Aragon, who had endured years of multiple pregnancies and a lack of post-natal exercise regimes. Starkey spoke of how Henry saw himself as immediately under God and how the word of God was given to him, which he then disseminated to the people. This is depicted in the title page of the Great Bible where Henry takes centre stage and most of the picture, while God is simply tucked away in the clouds in the corner, which amused Starkey. Starkey explained that Henry gave way for women to rule as monarch, and jested that Henry was the ultimate in equal opportunities; he gave them the power to rule, and didn’t think twice about beheading them. He quipped that the British never murder anyone – they execute them! 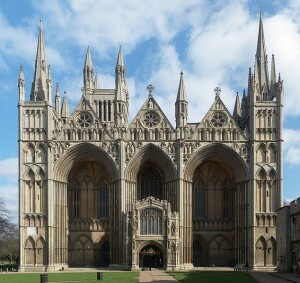 During an aside he bluntly asked the Archdeacon of Peterborough if he was allowed to use the term ‘gay’ as he remarked how he couldn’t understand Henry having so many wives, as it was either one of two reasons; you either love women a lot to want to have six wives, or you despise women enough to want to divorce 5 times. A member of the audience asked, “If Catherine had of bore Henry a son, do you think Henry would have still annulled the marriage?” Starkey answered that he believed that Henry would have been the loving and loyal husband he was previously. Starkey interestingly brought up new research of modern medicine that suggests that Henry may have had a certain blood group (Kell), which would explain the lack of children and high rate of miscarriage and stillborns. People of this blood group are more likely to have a child from the first conception, a “hole in one” Starkey bantered. 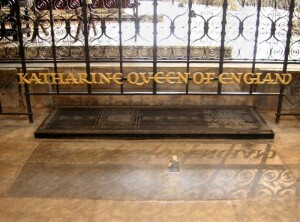 A steward asked Starkey about the Catherine of Aragon Cathedral myth – which is that Henry changed it from an Abbey to a Cathedral because he felt remorse for how he had treated Catherine of Aragon – to which David replied we have to remember we weren’t as sentimental back then and Henry certainly wasn’t. Also, he brought up the fact that it is because of Elizabeth that we still have cathedrals and ceremonial religious procedures. in an attempt to settle a dispute over the title and estates of the Earldom of Ormond . The 7th Earl of Ormond died in 1515, leaving his daughters, Margaret Boleyn and Anne St Leger, as co-heiresses. In Ireland, the great-great-grandson of the 3rd earl, Sir Piers Butler , contested the will and claimed the Earldom himself. He was already in possession of Kilkenny Castle – the ancestral seat of the earls. Sir Thomas Boleyn, being the son of the eldest daughter, felt the title belonged to him and protested to his brother-in-law, the Duke of Norfolk , who spoke to King Henry about the matter. 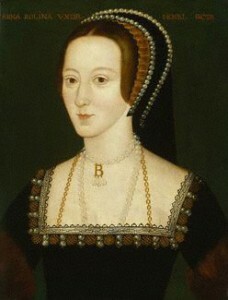 Henry, fearful the dispute could be the spark to ignite civil war in Ireland, sought to resolve the matter by arranging an alliance between Piers’s son, James, and Anne Boleyn. She would bring her Ormond inheritance as dowry and thus end the dispute. The plan ended in failure, perhaps because Sir Thomas hoped for a grander marriage for his daughter or because he himself coveted the titles. Whatever the reason, the marriage negotiations came to a complete halt.